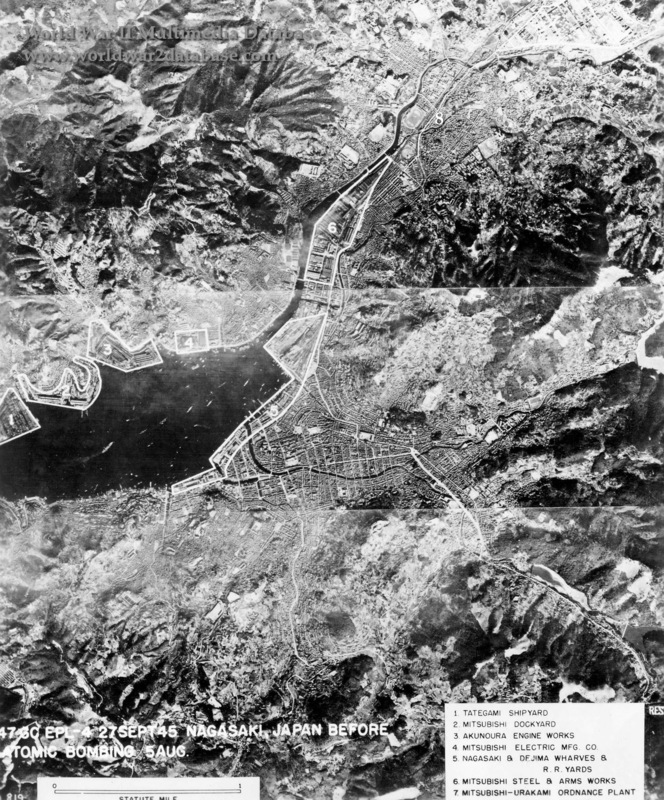 Annotated photo reconnaissance mosaic of Nagasaki four days before the blast. You can see how the atomic blast was trapped and funneled through the hills surrounding the city, minimizing the effects. Numbered areas are: 1.) Tategami Shipyards; 2.) Mitsubishi Shipyards; 3.) Akunoura Engine Works; 4.) Mitsubishi Electric Manufacturing Company; 5.) Nagasaki & Dejima Wharves and Railroad Yards; 6.) Mitsubishi Steel and Arms Works; and 7.) Mitsubishi-Urakami Odrdinance Plant. 8.) Shows the approximate position of the hypocenter when the bomb hit on August 9th .